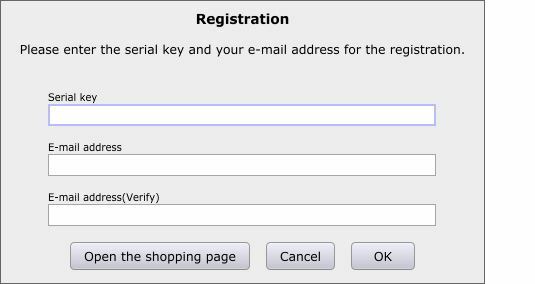 You can register serial key by clicking registration button. This window will be displayed. Please enter a serial key and your email address in the textbox and click OK button. Trouble has been confirmed with authentication of MacOSX 10.10 or earlier. This is a "TLS1.2 problem" on past MacOSX. If you are using that version of MacOSX, please use the below tools to complete the authentication. You download the ZIP file and you decompress the archive, it shows the DeeAuth app. Please enter a serial key and your email address in the textbox and click Registration button. Copyright © 2015 Dotec-Audio & fmfmsoft Corp.（株式会社ふむふむソフト) All Rights Reserved.